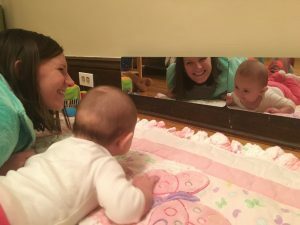 Mirrors are wonderful tools for engaging babies and toddlers. But what makes mirrors so intriguing and why should you hang one in your child’s play space? Infants are born with a natural attraction for gazing at faces. When your own face isn’t available for gazing, why not capitalize on this interest with an infant mirror? Prop a small infant mirror for your baby to gaze at and he can now stare at his own lovely face. 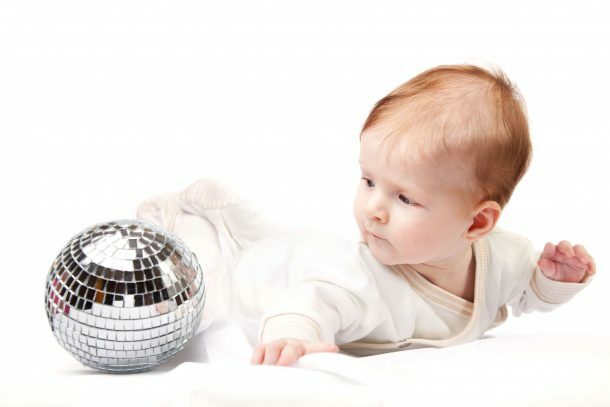 This activity introduces your baby to his own image, provides great motivation for tummy time/floor time movement (which increases strength), and fosters curiosity. When placing the mirror, be sure to keep in mind your baby’s developing eyesight capability. For older babies that are able to crawl and cruise, a great place to mount mirrors are low near the baseboard and by a pull up bar or table. Mirrors in these locations allows mobile babies to watch their own movements and provide incentive for moving. Mirrors aren’t only great for babies–they’re perfect for toddlers too! Mirrors allow toddlers to continue developing self-recognition. As we mentioned earlier, self-recognition is a process that takes several years to be actualized. Looking in the mirror with a toddler and asking questions such as “Who is that?” and “Where is your ____(nose, tummy, etc. )?” encourages self-identification and fosters language growth. Additionally, mirrors can help young children develop emotionally as they have more opportunity to witness their own expressions throughout the day. 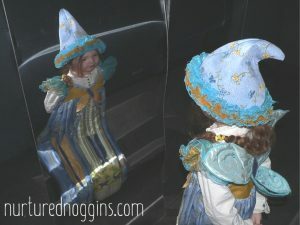 Some great places to mount mirrors for toddlers are in pretend play areas (especially ones with dress up clothes! ), places where frequent tasks take place such as hand washing and eating, in a “cool down” or “time out” spot, and even outside! The possibilities are endless. 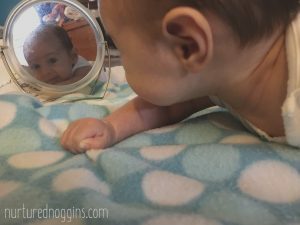 For young babies, floor mirrors are great options for floor play. These mirrors often allow you to adjust the angle so that your baby always has the perfect view. For mobile babies and toddlers, long mirrors that allow children to see themselves from a range of locations and movements are great. Always make sure any mirrors that children are near are shatterproof, easy to clean, and safely mounted. What a great way to incorporate self-recognition into early childhood learning! Love it. 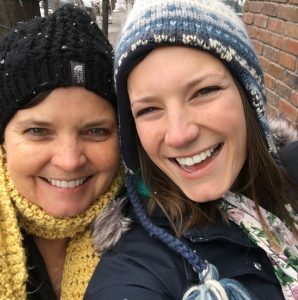 Thanks – it’s so fun watching children learn all about themselves and others! We love helping it happen.